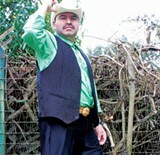 On the side of Alberto Martinez' big white van is a full-color photograph of himself, microphone in hand, cowboy hat on his head, eyes closed in concentration—singing a love song, quite obviously, with all his heart. "I love to sing," says Martinez, of Healdsburg, leading the way past his van and into his garage. "When I sing," he says, firing up his computer, "all of my troubles go away. That's what happens to the people listening, too. "Martinez—known as "El Cantante"—and his karaoke program have become prominent fixtures at weddings, parties, restaurants and quincea-eras. The sheer charm of his full-throttle performances aren't lessened by the fact that his "band" is a machine. "To me, sure, it would be easier singing with a real band than singing karaoke," admits Martinez. "I used to be with a band, but we didn't agree on everything, so we . . . kaboom! But we were very good! Now I just use my karaoke machine, and people like that a lot." Most of the songs he sings he has memorized—no small feat. "I don't have that many songs yet," he says humbly. "Only about 275 songs." A year ago, Martinez suffered a serious injury while working his day job at a local winery, resulting in a broken knee and tibia. He now has 18 screws and three pieces of metal in his leg, and is often still in pain. "Sometimes," he says, "it makes me so sad when I think about my accident. Since that time, I'm not the same guy as before. I used to be really—what's the word?—I used to go zoom-zoom, all around, all over town. Now I'm more at home all the time, because I am in so much pain sometimes. But when I sing, all the pain goes away. I feel like a new guy." Martinez tests his microphone, hits a few keys on his laptop and music fills the garage. Though his audience this afternoon is only a reporter and a photographer, Martinez gives a wonderfully energetic performance. "People really love it when I sing," Martinez says. "They tell me, 'Hey Alberto, someday you are going to go far.' I hope so. "So," he says, a big smile on his face as he taps again at his karaoke screen, "you want to hear another?" Alberto Martinez, 707.228.4849.—D.T. There are few settings more unusual and enchanting for a tiny wedding ceremony than the 360-square-foot Sea Ranch Chapel, which appears like a long-winged creature alongside Highway 1 in the seaside community of Sea Ranch. 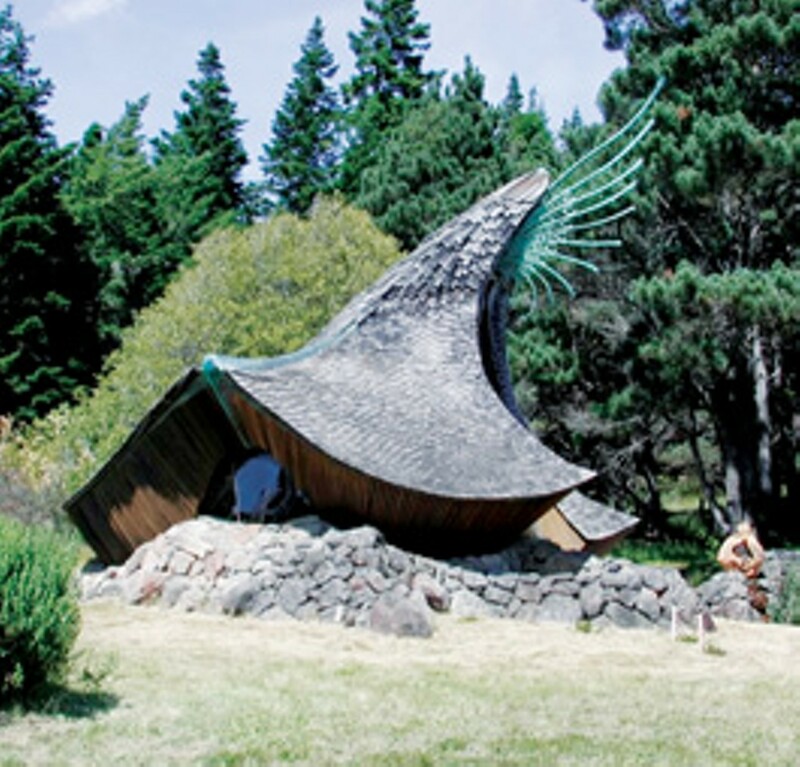 Designed by architect James T. Hubbell, this Dr. Seussian sanctuary was built largely out of native redwood, local stone, metal and glass, and from a distance, its wavy walls and roof seem to be in motion. A stone pathway leads visitors to a pair of elaborate teak doors with stained glass inlays, and the inside—adorned with sculptured wood, twisted iron-work and carved redwood pews, and softly illuminated by colorful stained-glass windows and doors—is like a Narnian dream.The chapel was originally commissioned by longtime Sea Ranch residents Robert and Betty Buffun in 1984, who described it as "a place that seems to stimulate the imagination . . . one sees with 'new eyes' natural materials used in dramatic combinations to create a work of art." Open to the public every day from 8am until sundown, the chapel's sign posted outside reads simply: "The nondenominational Chapel is for prayer and meditation. Please respect its sanctity." Despite its award-winning design, the chapel is largely unknown outside of Sea Ranch, although a number of small weddings have taken place within its redwood walls over the years. The cozy proportions accommodate up to 40 people (standing-room only) and can be rented by contacting the Sea Ranch Association. Mile marker 55.5, Highway 1, Sea Ranch. 707.785.2444.—K.F. Outside the entry to Santa Rosa's Byron Blodgett Jewelry Tech one day, a heavily tattooed man dropped to one knee and opened a small box. He slid the diamond ring onto the finger of the blushing woman in front of him, and as she threw her arms around him, the staff, watching from inside, burst into tears. "We all cried," says Byron Blodgett, veteran jeweler and owner of the vintage jewelry store, now celebrating its fifth anniversary in Railroad Square. The store specializes in art deco diamond engagement and wedding sets, but potential brides and grooms can also find unique pieces ranging from Victorian styles to modern jewelry made by Blodgett. "We get lots of low-key couples looking for something affordable and nonconventional in a vintage mounting," says Blodgett. Adding his two cents, a customer says, "Byron is an honest jeweler, does great repair work, and prices are very fair. He has my trust." And that's worth its weight in gold. 130 Fourth St., Santa Rosa. 707.528.3378.—S.D. The North Bay is a mecca for destination weddings, but for those couples in search of a matrimonial spot far off the beaten path to the altar, I offer the Peace Barn. It's so hush-hush, I can't tell you too much about it. Located in the hippy-meets-yuppie community of Bolinas, where celebrities like Alice Waters and Joel Coen retreat for privacy, the Peace Barn—so called for the glowing blue peace sign that hangs on its front—is owned by Susie Tompkins, co-founder of Esprit and close pal of Hillary Clinton. For years, Tompkins has made the impeccably restored barn available at no rental fee for a select number of weddings, which come complete with tables, chairs, lighting, bandstand and all the fixings. There's a catch, of course—the betrothed couple must donate $10,000 to one of several charities supported by Ms. Tompkins. That is, if you can find her. Location under wraps, Bolinas—K.F.